I have always been an advocate for the “oh this outfit? I just threw it together, no biggie” look. I like when your clothes look effortlessly put together, even if it really took your 45 minutes to perfect it. 3. When in doubt, black is best choice. From staring at my closet for an hour and a half not knowing what to wear to having under 15 minutes to get out the door, these rules have led me to success on many occasions. Despite this, they have also led me away from a variety of pieces and accessories, including heeled sandals. This is one shoe I avidly avoided. Who needed a slight, two-inch heel? It didn’t make sense. Either be five inches tall, a solid wedge or completely flat. The in-between felt like it was trying too hard. 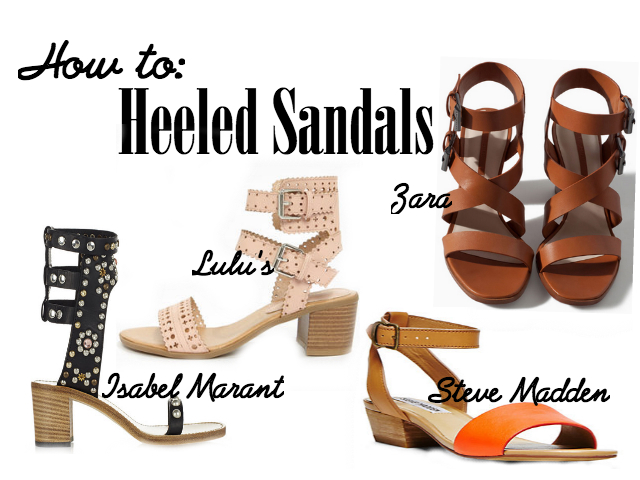 This spring though, I have come to love heeled sandals. In the right styles and colors, they add a level of chicness to any daytime look or an element of casual to any night outfit. With cuffs at the ankles, multiple buckles, color blocking or studs, these baby heels are taking spring wardrobes to the next step. Distressed denim shorts: High waisted or hip huggers, a loose pair of distressed denim paired with a graphic T-shirt and a patterned blazer is the perfect day look. Loose sundress: Dress up a loose frock with a little bit of heel height. Pick dresses in bright colors and styles that only hug your chest for the ultimate feminine touch. Dropped hem skirt: Tight around the toosh with a ruffle dropped below. Paired with a crop top or tank top, this look gives the ideal flirtatious, playful attitude. Asymmetrical skort: The bold, Zara-inspired envelope skirts killed it this past fall with heeled booties. Continue the look with a white or patterned skort and heeled sandals. Similar effect, but a more summery vibe. The key? Play with loose silhouettes and shorter garments. The small heel with slim and lengthen your legs without the pain of a higher heel.